The Blackhawk Universal Radio Carrier is an adjustable carrying system that fits most police, fire and business band radios. Its adjustable straps fasten with hook and loop closures, providing a secure custom fit for your communications equipment. The open top accommodates an extended antenna, and features an elastic retention cord that keeps the radio securely inside the pouch. The carrier is made from durable Cordura nylon, making it extremely strong and wear-resistant for maximum survivability in tactical environments. 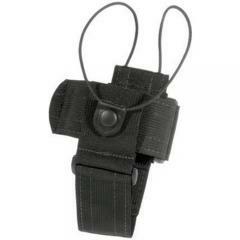 It attaches securely to your belt and fits belts up to 2.25 inches wide, including most law enforcement duty belts. Great for larger radios, icom radios are a little small but will fit.